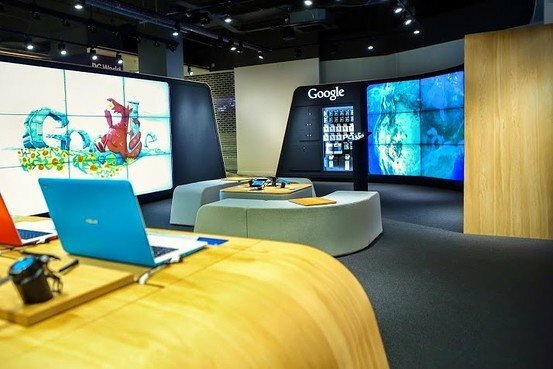 The new Google Shop is based inside the Currys PC World outlet on Tottenham Court Road, as noted by The Wall Street Journal. Although Google has branded the space, the company isn't making any direct sales income; instead, all sales are going to Dixons Carphone. Dixons Carphone CEO Sebastian James elaborated that the Shop is "billboarding" for Google, and not being rented out. He nevertheless described it as "fantastically expensive" for Google to have constructed, and an experience that can't easily be reproduced. One attraction in the space is a surround-screen installation where people can fly over the planet using Google Earth. Another, the "Doodle Wall," lets people use digital "spray cans" to do a version of Google's logo and share it on social networks. Google has said it is planning to open two more London-area shops later this year, within Currys PC World stores in the boroughs of Fulham and Thurrock. The Google Shop is a step up from American pop-up stores, and the Chromebook showcases in US Best Buy locations and various Dixons outlets in the UK. The company has also had its own staff working in chains such Walmart and Office Depot. The new effort may be intended to draw mindshare away from Apple, which has its flagship London store a short distance away on Regent Street. It's unknown though if Google will venture into a fully owned and operated retail business, which could put the two companies in even fiercer competition. Two years ago the Journal reported that Google was considering the possibility, but so far it hasn't taken any concrete steps. Now it has an increasing number of hardware products it could potentially sell, including phones, tablets, Android Wear watches, and Nest home automation gear, as well as a variety of accessories.